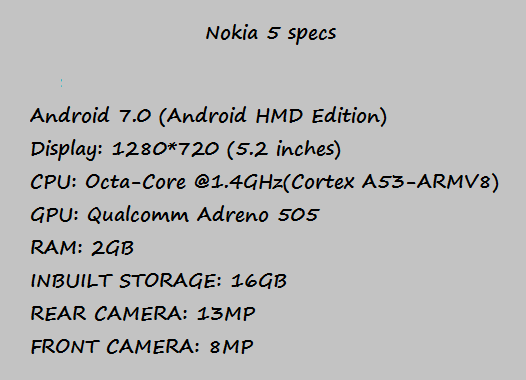 Nokia 5 Price Specification Description Nigeria India China UK US Pakistan Belgium UAE Saudi Arabia. Nokia 5 is a budget smartphone amongst the 2017 release line-up of Nokia. The smartphone was earlier referred to as Nokia Heart in a previous leak and most probably should stand for its code dev name. The smartphone is a low end one and comes preinstalled with Android 7.0 Nougat. Nokia 5 sports a Snapdragon 430 chipset and 2GB RAM. The inbuilt storage is 16GB. The rear camera is 13MP while the front facing camera is 8MP for selfies and video recording. The smartphone has Adreno 505 GPU to keep up with Graphics demands. The smartphone uses the same chipset as Nokia 6. That means less money with an able chip and also Android 7.0 Nougat. Nokia 5, like most budget devices is expected to cost around $100 to $160 when it is finally up for grab by the public. That means around 60,000/70000 Naira in Nigeria.